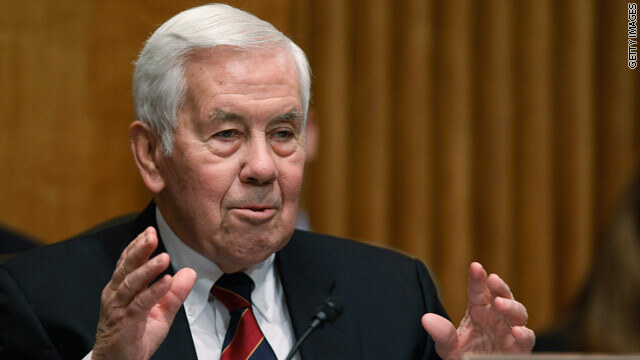 Washington (CNN) - Senator Richard Lugar, R-Indiana, on Sunday questioned the decision by the United States to pursue military action in Libya without clearly defined objectives, and expressed concern over the role of the U.S. in Libya's future. Lugar, the ranking Republican on the Senate Foreign Relations Committee, said, "Where does our involvement stop? This is why, before it begins, we ought to have a plan and we ought to have outcomes defined as to why American forces, American money are going to be at stake." Though he acknowledged the humanitarian crisis in Libya, Lugar raised the issue of continuing unrest throughout the Middle East region - and if, with two wars already underway in the region, the repercussions of the decision by the U.S. to participate in the institution of a no-fly zone in Libya had been thoroughly examined. "Once again, we in the United States have not defined what we believe the outcome should be." Lugar said. "The president said Gadhafi should go because he's a monster and so forth, but is our objective that Gadhafi must go, in the way that Saddam Hussein must go, eight years ago for example? Precisely what outcome do we anticipate with the rest of the Libyans that are left? We don't know of an alternative government. But we know that many of the Libyans in the eastern part of the country went to Iraq to fight with Iraqis against American forces." Lugar also said the U.S. cannot afford another war, and cited the current congressional budget fight over spending cuts. "The fact is we cannot afford more wars now, and we're going to have to find in fact some curtailment of our military budget in addition to the so-called spending that we do, the 30 percent that we've been dealing with. There's another 70 percent out there and defense is a big part of it. In the midst of that, we have to be thinking carefully what our obligations are, how long they might continue." The plan to attack Libya has sent a very confusing and dubious message to the international community. Not the international community of diplomats and leaders, but to ordinary folks around the world. It's a message of clear double standard against Libya, when Bahrain, Saudis and Iran, have quickly suppressed their own oppositions though open and secret killings and arrests. It's unfortunate that our nation would be part of this unfair application of different standards to similar situations. A friend commented, it's undemocratic to side with a minority over the majority in Libya, that it's a bully and cowardly attitude, because the said coalition will not attack Iran, North Korea or Russia, no matter what they do to their people. He is absolutely right about this. We cannot continue to be – Cops of the planet, we are broke! Who is going to pay for this latest escapade? We are laying off teachers and nurses and getting involved in saving everyone else's situations.. When is it going to STOP? When we run out of Government Funding in two weeks, who is going to save us? You did notice that Russia and China are staying out of it. Now we can add to our bill for this with China to cover our latest credit expense. Actually, I'm glad Luger asked the question (where was he before the Iraq invastion, though?). The answer should be no "regime change", no "nation building" and no boots on the ground. Protect the protesters and nothing more. Let them do the heavy lifting in terms of building a new country. We can't afford and shouldn't be doing that even if we could. Just watch, though, as the neocon war-mongers try to ramp up US involvement. THe Repub cannot have it both ways! And it's a safe bet that if the US had not pushed forward with a UN intervention, Lugar and his party would be complaining about how we need to intervene. The party of no has become the party of nay. I'm with most everyone else here...where was he when Bush started the Iraq mess? Did he protest as hard of at all? I agree, we were smart not to go unilaterally or even be the first in. For a change; government that actually thinks before reacting. Still, I'm not happy about another war to pay for. Again, the GOP hypocrisy is stunning, yet predicable.